Moving beyond from just a fascinating fragrance, we have introduced Call Clients Incense Sticks that can help you to bring good luck in business. The Fancy Series collection of incense is a basket of exotic fruity fragrances. Its aroma is like splash of freshness that re-energize you. Definitely, it is exactly what your senses wish to gulp-up. 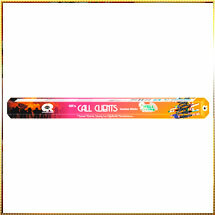 We have prepared these call clients incense sticks with a variety of ingredients that attract positive energy and thus can help you make your important works. We have used special ingredients which help to achieve the positive result in business. So, we have named it as " Call Clients" as per its usage suggests.